Every once and a while, I take one of my sisters kids to give my little man a little company. Back in March I took my oldest nephew and while he was here, we decided to get a little crafty! I was sent some Sharpie markers in January to test out for planning but I knew we could get a little more creative with them. We opted to do slippers because who doesn’t hate reminding their kids to stop sliding around the house? 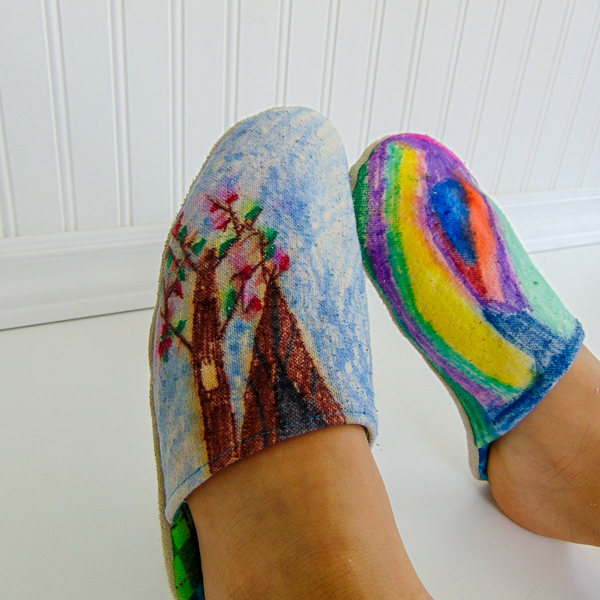 We got out some canvas and used this tutorial from Sew Can Do for the slipper shapes and got to colouring! The boys had a blast colouring with the bright colours and it was great for my son to be a little more abstract with his artwork instead of always striving for perfection. They definitely were not afraid of colour while drawing! Now I am sure you have seen those sharpie crafts on Pinterest where you add some alcohol and the colours magically blend together…. well, that didn’t work quite as planned with the canvas fabric 😉 it was much too thick! Instead we ended up with more of a watercolour look rather than full colour mixing. I did a layer of foam within the sole so that it is good and squishy while wearing. There is also a layer of fleece in the top for softness as well! For the sole bottom, we used the suede side of some leather scraps to make them extra grippy! The only major downside to making these guys? Little man’s feet grew half a size between colour and when I finally got them sewn! We are hoping that they will loosen over time as he wears them out. He still loves them anyways and likes that they stay snug while on! Have you ever done anything crafty with Sharpie markers? Let me know so we can play some more too! For more kids crafts, check out my post on 4 Sewing Projects to get Kids Sewing!